— Museum of American Folk Art Encyclopedia of Twentieth Century American Folk Art and Artists by Chuck and Jan Rosenak, Abbeville Press, New York, 1990. 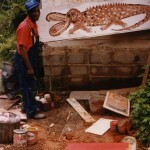 Born in Caines Ridge, Alabama, Jimmy Lee Sudduth achieved recognition for his colorful paintings made with mud, sugar and natural pigments. He had little formal education, and his teachers said he would like to draw then learn his subjects. 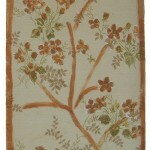 Before he started to paint full time, he worked in the nearby farms and at a gristmill. 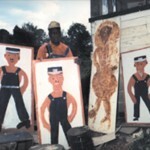 His paintings are made of mud, which he claimed he has been doing since he was three years old. 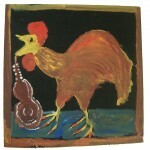 In the late 1960s, he started appearing at county fairs with his harmonica and his mud paintings, and that is when others began to learn of his work. Often Jimmy started with a plywood base and outlines images with the soft stones he called “dye rocks.” When they are dipped in water, they soften, enabling him to make a heavy line on the board. 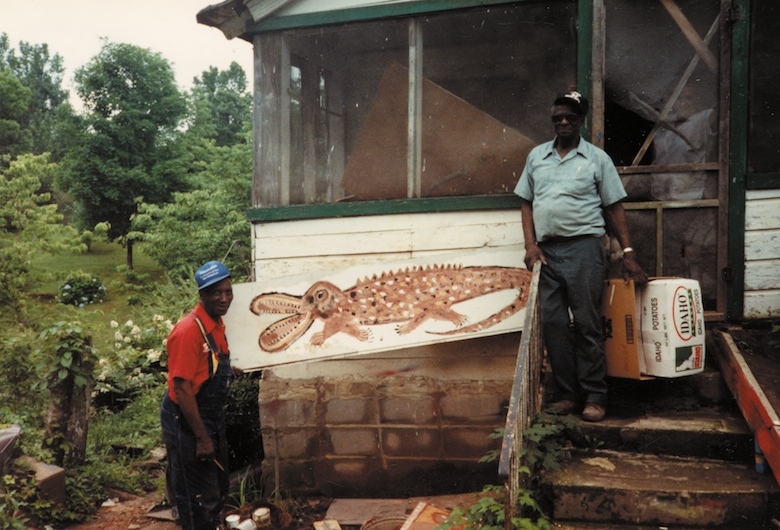 Then he mixed his sweet mud of local dirt with sugar or soda pop (which creates a powerful binder)—“Gotta be that good Alabama dirt”—and started to paint. 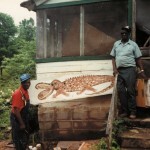 His older paintings were colored with natural pigments from weeds and vegetables, which he rubs on the surface. 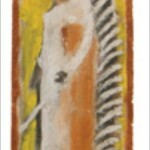 Later paintings are made with house paint. 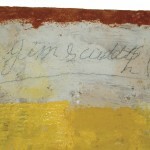 In addition to painting, Jimmy was known for playing a mean blues harmonica (although a doctor advised him to put it away), and enjoyed the perks of fame, evidenced by a scrapbook filled with photos of all the pretty girls who have visited him. In 1976, he performed at the Smithsonian Institution’s Bicentennial Festival of Folklife.